For the severe weather data for a particular month, choose the month and year and click "find". Note: the data is in .pdf format, and you will need Adobe Acrobat to view it. Also, these monthly reports will usually become available 30 to 60 days after the end of that month. Note: The "Top 10 events of the year" since 1999 can be found on our old event summaries page. The following summaries cover "significant" or widespread thunderstorm outbreaks and tornadoes. Tornadoes, hail, wind damage, and flooding impacts can be found in these summaries. If the event was focused mainly on flooding it will be found under the "Flooding" section. Click here for an overview of the early start to the 2017 severe weather season and how it compares to past years. February 15, 2019: Around 1/4 inch of ice in parts of west KY and up to 5 inches of snow in southern IL. January 11-12,2019: Snow and sleet impact travel with amounts as high as 4-7 inches in portions of southern IL. March 11, 2018: Snow event with amounts ranging from 2 to 5 inches, localized up to 6 inches. February 6-7, 2018: Ice event with amounts from a few hundredths to 0.25" across much of the region. January 15, 2018: Snowstorm produces 5 to 8 inch swath of snow across southeast MO into west KY; 1 to 4 inch totals area wide. 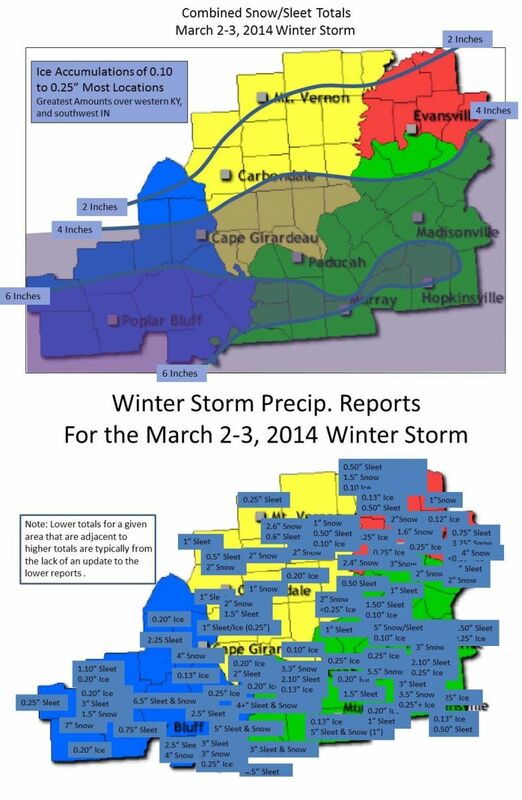 January 12, 2018: Sleet and snow accumulations impact region, up to 7 inches in parts of west KY.